Blue Pete’s Restaurant is located in the historic Pungo area of Virginia Beach, Virginia. We offer unparalleled waterfront views, public and private events, high quality service, delicious food and a relaxed atmosphere for the whole family to enjoy. Experience the friendly ambiance and natural setting of what we lovingly refer to as “the locals’ secret.” We are a convenient, 10-minute drive from Sandbridge Beach, the Back Bay Wildlife refuge and shops at Red Mill, and a quick 20-minute drive from Virginia Beach oceanfront hotels and attractions. Blue Pete’s boasts exceptionally fresh seafood and American fare with a laid-back vibe that will make you feel like a local. Come join us for a great meal seasoned with all the friendliness of Virginia Beach. Lightly fried and seasoned, tossed with Parmesan cheese. Served with a Thai chili sauce. A creamy blend of lump crab meat, onions, garlic, red peppers and Parmesan cheese. A creamy blend of fresh spinach, artichoke hearts, garlic and Parmesan cheese. Coconut breaded jumbo shrimp served with our house-made raspberry dipping sauce. A never before seen nacho that will rock your seafood socks. Fresh tortilla chips, shredded lettuce, house-made pico, topped with seasoned calamari, house-made marinara, Parmensan and Baja sauce. Serves six. Breaded chicken tenders served Hot, Mild, BBQ, House or Naked with house-made ranch. Fresh mixed salad greens, grape tomatoes, red onions, green bell pepper, sliced cucumber and shredded cheddar cheese. Crisp romaine hearts, creamy Caesar and shredded Parmesan cheese. Fresh mixed greens, red onions, kalamata olives, green bell pepper, grape tomatoes, pepperoncini, crumbled feta cheese and Greek vinaigrette. Thinly sliced beef, grilled onions, provolone cheese and cream cheese served on a toasted sub roll with lettuce and mayo. Mouthwatering brisket, Provolone cheese and cream cheese on a toasted sub roll with a side of au jus. Our delicious lump meat crab cake, fried or broiled, and served on a dusted kaiser roll with lettuce and tomato. A 6 oz blackened or grilled tuna topped with sautéed mushrooms, onions and melted provolone cheese on a dusted Kaiser roll with lettuce and tomato. Fried shrimp, lettuce, tomato, bacon, thousand island dressing, provolone cheese and cocktail sauce. Served on a sub roll. Fried oysters, lettuce, tomato, bacon, thousand island dressing, provolone cheese and cocktail sauce. Served on a sub roll. Blackened tuna over brown rice, topped with cheddar cheese, lettuce, our house-made baja sauce, and pico de gallo, all served in a 12" flour tortilla. A crispy filet of flounder lightly breaded and fried to perfection, all served with our house-made baja sauce with lettuce and tomato on a dusted Kaiser roll. Grilled or blackened chicken breast topped with bacon, provolone cheese, lettuce and tomato. Served on a Kaiser roll. A juicy 8 oz Angus patty smothered with sautéed onion, crispy apple-smoked bacon, all caramelized with our house BBQ sauce. Topped with cheddar cheese and an onion ring, served on a Kaiser roll with lettuce and tomato. A juicy 8 oz Angus patty topped with our homemade lump crab cake, cheddar cheese, and served on a Kaiser roll with lettuce and tomato. A generous portion of slow-roasted mouthwatering brisket. Grilled or blackened chicken, served on a bed of sautéed baby spinach, topped with creamy spinach and artichoke sauce. A 12 oz cut of tender, flame-broiled Angus beef topped with sautéed mushrooms and a peppercorn cream sauce. A 12 oz cut of tender, Angus NY Strip, flame-broiled and topped with four perfectly seared jumbo sea scallops. Two jumbo crab cakes made from fresh, premium lump crab meat, fried or broiled to a golden brown and served with our roasted red pepper aioli. Fresh ahi tuna grilled or blackened and topped with sautéed mushrooms, onions and provolone cheese. Two flounder fillets fried to a crispy golden brown and served with tartar sauce. A generous portion of fresh sea scallops lightly seasoned and pan seared. Served with cocktail sauce. 12 oz honey-teriyaki marinated ribeye. Upon request/availability. The rib-eye must be marinated for 2 days before serving. Grilled or blackened Mahi topped with a lump crab cake and a drizzle of our award winning she-crab soup. Grilled or blackened salmon, served on a bed of sautéed baby spinach, topped with creamy spinach and artichoke sauce. Blackened or grilled salmon topped with a creamy mixture of lump crab meat finished with Parmesan and bread crumbs. A generous portion of shrimp lightly breaded and flash fried to a flavorful crisp. Served with a side of cocktail sauce. A generous portion of oysters lightly breaded and flash fried to a flavorful crisp. Served with a side of cocktail sauce. A juicy Mahi filet blackened or grilled and topped with our house-made, mouthwatering mango salsa. Premium quality flounder filet stuffed with lump crab meat, spices and breadcrumbs then topped with our award winning she-crab soup. Lightly breaded chicken breast topped with Provolone cheese served over linguine with marinara sauce. Grilled chicken and fresh broccoli in a creamy Parmesan Alfredo sauce over penne. Shrimp, scallops, clams and calamari served over linguine in a white wine and lemon butter garlic sauce. A homemade, warm fudge brownie topped with vanilla ice cream, whipped cream and chocolate syrup. Fresh and tart key lime pie made with fresh lime juice and garnished with whipped cream. Creamy and delicious white chocolate almond cheesecake garnished with whipped cream and white chocolate shavings. A delicious take on traditional bread pudding made from scratch using our signature sweet potato biscuits and fresh sweet potatoes. Topped vanilla ice cream, whipped cream and our homemade praline sauce. A Gratuity of 18% will be added to checks of parties of 6 or more and a Gratuity of 20% will be added to all split checks. (GF) GLUTEN FREE; This dish contains no gluten products. * ADVISORY: consuming raw (seafood) or undercooked meats may increase your risk of food-borne illness. Our restaurant is currently located on a beautiful five-acre spot in the Back Bay area of Virginia Beach, just minutes from the Back Bay National Wildlife Sanctuary. The natural area surrounding Blue Pete’s is an awe-inspiring gift from Mother Nature. Located on the banks of the aptly named Tabernacle Creek, the beauty and peaceful atmosphere make it is easy to see why it was named after a small place to worship. Here at Blue Pete’s, we want our customers to come in and relax in comfort, enjoy phenomenal food prepared and served by our caring staff, and leave with full bellies and refreshed hearts and minds. You’ll quickly learn why our locals return over and over again. Blue Pete’s is currently owned and operated by twin brothers Nicholas and Aristotle Cleanthes. Born in the Back Bay area, they became avid hunters, fishermen, outdoorsmen, and frequently lend a hand to local nature conservation efforts. Their love for this area, good people, great food, and the country lifestyle is what inspired them to acquire Blue Pete’s and carry on the tradition of a place for locals and visitors to come together and enjoy themselves in a relaxed and natural setting. The brothers, who grew up in the area, and live locally with their families, are still closely tied to it through multiple conservation efforts throughout the year. “We are right next to a National Wildlife Sanctuary. If we don’t take time to take care of it, who will?” says Aristotle. Nicholas and Aristotle opened Blue Pete’s several years ago with the intent of reviving a classic restaurant in a breathtaking location. Their goal has been and will continue to be to build a place for families and vacationers to come in and have a good time, relax, and sample some excellent local cuisine. Before 1972, the property on which the restaurant was built housed a small marina and fish house. In 1972, Pat and Betty Ann Ricks opened Blue Pete’s and began the first expansion. Originally a cozy and homey place with seats for about twenty people, patrons could buy bait, play a little pool, listen to country music, or sit at the bar for sandwiches and beer. Though the business has grown and changed over the years, the goals of the current owners are much the same as they were over 40 years ago – to provide food and good experiences in a friendly and homey atmosphere. Their love for this area, good people, great food, and the country lifestyle is what inspired them to acquire Blue Pete’s and carry on the tradition of a place for locals and visitors alike to come together and enjoy themselves in a relaxed and natural setting. 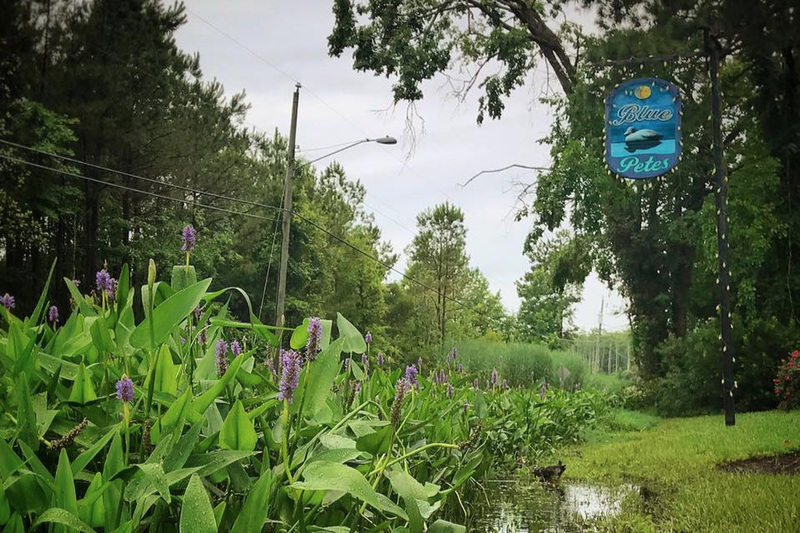 In order to continue the long-standing tradition of serving great meals and offering a local watering hole for the residents of Pungo, Blue Pete’s has plans to close for renovations beginning in September of 2019. Rising water levels in the area have provided the needed incentive for us to rebuild a bigger, better and drier Blue Pete’s. We look forward to providing the same great service and high-quality food, while remaining a staple in the community and attraction for tourists, just a few feet higher above the water level. Stay tuned for updates and details! For reservations, hours, directions, or general questions please call us at (757) 426-2278. For events or catering, please email our Event Coordinator directly at info@bluepetes.com. Please use the contact form below for all other questions or concerns. Plan your event with the locals’ secret! We offer a variety of catering and event hosting options to suit your needs. Contact us today & book your next event with Blue Pete’s!